I highly recommend Adam Oppenheimer. He listens to your concerns and does the best job possible to make you happy. I recently had a rhinoplasty with him, it has not even been 3 months and my nose already looks fantastic. Make an appointment with him, you won't be disappointed. ​Couldn't have asked for a better experience! Dr. Oppenheimer and his team were nothing short of wonderful before, during, and after my procedure. I sought them out for a labiaplasty because it was affecting my quality of life, and I couldn't be happier with my results! I'd never had surgery before for anything, and they made everything so easy and were available around the clock to put my mind at ease. They're the best! ​I had the best experience, GREAT surgeon! 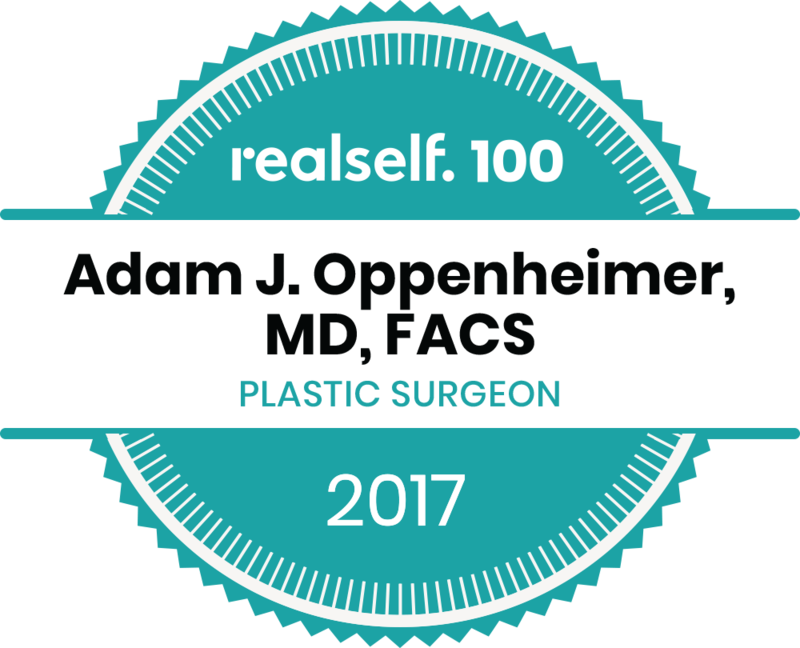 I had a great experience with Dr. Oppenheimer, not only was he very welcoming but made me feel very comfortable with the whole experience. He listened and heard me out about my issues and needs, he was also very detailed about what he was going to do throughout the procedure. He is a great surgeon and completely enjoyed the whole experience, I would highly recommend him as your surgeon. I highly recommend Dr. O! I got a breast augmentation and am 3 months post opp. He has great bedside manner, listened to what i was wanted, was thorough and over delivered! I couldn't be happier with the results. My husband and I both love the results!! What a nice and friendly doctor. I felt very comfortable with him and the procedure. It was painless. He was very professional and makes sure his patients are comfortable at all times . His staff is great also! Amazing!! Quick and effective!! I came in for the first time to have a procedure done and it is was quick, he and his staff were extremely professional. I would definitely recommend him to anyone! I will always came back to him! I love Adam! I hated my lips and smile lines for so long. I was scared to get anythjng done until I met Dr. O. He made me feel very comfortable and at ease with getting my lips and smile lines done not to mention the results were truly amazing! Me gusto todo. El doctor y la enfermera son may amables. La oficina es limpia. Entre un dia y sali el dia siguiente. No tuve infeccion. La recuperacion hacido larga pero valio la pena. Todos furrow profesionales. El trato fue muy bien, todos atentos y muy amables. Me gusto el ombligo. Mi autoestima subio, ya me siento mejor. Ahora tengo cintura. ​Amazing experience and amazing results! Dr. Oppenheimer did such a great job on my implants! This was a very complicated surgery. He is a perfectionist. My husband said my breast look better than they ever did. The surgery center was very nice. His nurse Christina made herself available all the time in case I had any questions. All of his staff are very friendly and professional. 22 years old, no kids. EXTREMELY HAPPY WITH MY RESULTS, THANK YOU DR. OPP!! Tummy Tuck @50, New Me!! Just had my 4 month post op appt and I was so excited because this is the beginning of a new chapter for me. Dr. Oppenheimer has magic hands and a gentle approach to boot. I'm loving this new flat stomach with the new belly button. Now I can look at myself in the mirror with lots of confidence. Knowing that my clothes fit perfectly, thank you Dr. O!!!!! Feeling wonderful! 62 years young. THE BEST of the best, no need to consult anywhere else... SERIOUSLY!!! I should've written this review almost 2 years ago when I first met Dr. Oppenheimer or really known as "Dr.O". He's that cool! Two Weeks out and Loving my New Girls!! Completely professional, caring, and trustworthy! Extremely pleasant experience all around. ​"51 and Want to Be a New Woman"
Dr Oppenheimer has a great bedside manner and is a very caring doctor. He makes you feel very comfortable from beginning to end. 36 Year Old, Happy I Finally Did It! Amazing doctor and caring staff. I highly recommend Dr Oppenheimer and his team. I traveled from NY to Orlando for my surgery because I know and trust Dr. Oppenheimer. You couldn't ask for a more caring surgeon. From the initial call of interest to the day of surgery and follow-up, Dr. Opp was always the most professional, dedicated and caring person. He is very gentle and truly cares about his patients and their results. I highly recommend Dr. Oppenheimer. About 2 weeks ago, I had the pleasure to be Dr. Oppenheimer's patient. I was amazed by his bedside manners and his caring personality. He was very professional and explained the entire procedure! I couldn't have asked for a better place to get my Dysport injections!! ​I cannot say enough about Dr.O. I am a 20 year old who barely filled an A cup. I am also a fitness model and competitor and have always felt very self-conscience about my chest. I went to four other consultations before I found Dr. O. Not only did I appreciate his knowledge and work, but I wasn't rushed at all during the consultation and he made sure to answer every little question I had. I am now almost 2 months post-op and have received countless compliments regarding his work. I would refer anyone to him in a heart beat. I am so pleased with how everything turned out and recovery was a breeze. I got 340 cc UHP. Everything is perfectly symmetrical and the healing is looking great. Professional, courteous, up to date knowledge on the most current trends and procedures, super caring and friendly! Dr. Opp is the best! Dr. Oppenheimer is totally amazing! Not only is he extremely nice, but he is also honest. He explained my procedure, and answered all my questions thoroughly. He even told me he would not do certain procedures I inquired about because he stated I did not need them, so he isn't out to just make money. He also educated me on too much sun tanning, and other recommendations that would make my FL sun kissed skin more healthy. I have to admit I was scared at first, being this was my first procedure, but my surgeon and his staff made me feel so comfortable and welcome every time I have been to the office. They treat me like I'm a friend they have known for years! I drive an hour just to get the best plastic surgery care. Dr Opp is the best! He is the most humble man. He deserves all the credit, he's an artist. He has a vision, and he will measure triple times to make sure he gets the best results for you. Don't be fooled into thinking he's inexperienced because of his young age, he definitely has the goods. He's an expert! Plus he has a cute sense of humor, you will love his personality. He's super clean, and thorough, I felt safe right away. His staff is so kind and sweet, and accomadating. I slept so peacefully in their care. Dr. Oppenheimer was confident that he could give me the symmetry I was searching for with minimal scarring. He was respectful, always concerned in keeping my modesty, and thorough with a calm demeanor. My husband and I are very pleased with the outcome. His nurse, Christina, gave her number to be reached for any questions, and she was more than accommodating to see me on short notice when a concern did arise. She is very knowledgeable and was reassuring to me with her support and suggestions. My labia minora began to grow when I was going through puberty, causing discomfort with not only tight-fitting jeans and shorts but even with certain underwear (not just thongs, but various other types depending on how they were made) and even if I just sat a certain way. It was very frustrating to deal with for more than 10 years and I also did not like the way they looked but I made my peace with that; my main issue was with the discomfort I would experience on a daily basis. This was nothing I felt I could talk to my mom about growing up and I was too embarrassed and scared to talk to anyone else (I did not realize how common this issue was at the time) so eventually I got around to doing some research and discovered labiaplasties and read about the different techniques used (trim vs. wedge). At the age of 25, when I finally worked up the courage to go through with the procedure, I researched many surgeons in the Orlando area (I'm not going to trust just anyone with my lady parts!) and they all seemed to have very mixed or poor reviews, except Dr. Oppenheimer. After researching his website and patient reviews, I decided to schedule a consultation with him and I never once regretted it. He and his entire staff were very friendly and welcoming each and every step of the way! During my first consultation, Dr. O made feel 100% comfortable talking to him about my issues (which I always thought would be mortifying to talk about) and he was VERY informative on the procedure and his techniques, what to expect when recovering, post-operative self care, etc.. During the initial examination, he and his nurse Christina (who was present the entire time) made the experience very comfortable and informative; they gave me a mirror to hold so he could explain what he would do with my labia during the procedure so I could visualize what the end result would look like. Christina was also great through everything; during my pre-op appointment she described everything I needed to do before and after surgery in great detail and even gave me her personal cell phone number in case I had any questions or concerns at any time. The day of the surgery was a breeze; Dr. O and his staff made it very easy and I felt confident in them which made me feel a lot less nervous (I had never had surgery nor been under any anesthesia before). Everyone was so kind to me and everything went very smoothly. I did not experience any pain until later that afternoon (my surgery was at 7am on a Friday) when the local anesthesia wore off. I took the prescription pain meds up until Sunday and kept applying ice packs on and off, which helped control the pain. I was back to work that Monday (I am a nurse and was working 8 hours a day, 5 days a week at the time), which was rough but bearable. I definitely found comfort in the fact that I could contact Christina at any time, although I didn't need to. The post-op appointments were very reassuring, and it was good to see the progress I was making with healing and seeing before and after photos. Any questions I had were answered by Dr. O and his nurse who were both amazing through this entire process. I 100% recommend Dr. O to anyone considering getting a labiaplasty. It was definitely worth it for me as I now experience no discomfort like I did with my enlarged labia and I love the way they look now! Even if you are having any doubts or second guesses about getting the procedure in general or if you are scared, I assure you Dr. O and his staff will make you feel so comfortable and what is usually awkward to talk about will feel like natural conversation with them! At least get a consultation and take it from there. I am so happy I finally did after years of frustration and discomfort.